Classic Sweatshirt with B&W IMAX 15/70mm Countdown Wide Stripe on Whit - Film Leader Co. LENGTH 26.5" 27.25" 28" 28.5" 29.25" 30" 30.75" 31.25" 32"
CHEST 38" 40" 42" 44" 46" 48" 50" 52" 54"
SHOULDER 4" 4.25" 4.5" 4.75" 5" 5.25" 5.5" 5.75" 6"
SLEEVE 24.25" 24.75" 24.25" 24.75" 25.25" 25.75" 25.25" 25.75" 26.25"
Made of 100% Cotton French Terry. 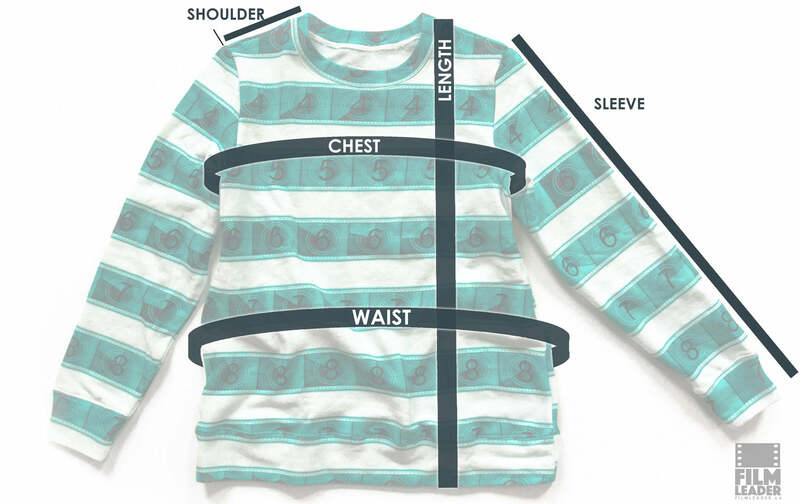 Each sweatshirt is a handmade one-of-a-kind piece, with variations in the design from shirt to shirt. Because each shirt is custom made one at a time, it may take up to 3-4 weeks to ship.